Wow, I can totally understand why this book had so much hype surrounding it. I picked this book up because of several reasons. First, all the positive reviews encouraged me to read it and the blurb seemed like I would like this book. Plus, the cover looks so awesome. It's so beautiful! This book is based in a fantasy world, where an Empire, based on Ancient Rome, has taken over the Scholar land and enslaved the Scholars. Living in a seemingly normal Scholar family, Laia is a free woman and is trying to support her family. That is, until her brother is captured and her grandparents are killed. She seeks the Resistance to help free her brother and in return they want her to spy on the Commandant of Blackcliff Academy, where the dangerous Masks are being trained. That is where Elias is training to be a Mask, even though he didn't want to be a Mask. And that is where they meet. This book was amazing. It is told out of two perspectives: Laia's and Elias' perspectives. This is done very well. The plot progresses really quickly on both ends and once both the characters meet, it is interesting to read about both of their thoughts. The plot was very interesting, intriguing and flowed very nicely and I love it. All the solutions to the problems were interesting and the problems were so intense.I guess, that some things were kind of predictable and some things weren't, but that's what makes a book really good. All of the characters were amazing and written about really well. All of them had their own unique personalities and I will probably start talking about Laia. She is a very quiet girl and I found, that I could somehow relate to her. She just wants the best for her family and I just really liked her. Elias was the kind of guy, who was good at something but doesn't enjoy it. He is rebellious and unlike other Masks, he actually knows mercy, kindness and friendship. I kind of liked him and the more I read out of his perspective, the more I liked his point of view. Helene Aquilla is a different story. I guess I can understand where she's coming from and why she does some things, but I just didn't like her personality. Especially when she was interfering with my ships! Yeah, while I was reading this book I was busy shipping Laia with everyone. First I shipped her with Elias and then I shipped her with Keenan and stuck with that. Keenan is really sweet and Laia and Keenan really belong together. I loved how the book was written. The story was flowing really nicely and I think I detected some kind of a deeper meaning. Don't give up. Do what you think is right. 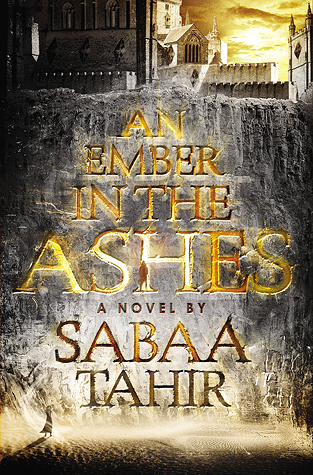 Sabaa Tahir wrote in a way, that makes the reader connect with the characters. They feel what they are feeling. This was definitely an amazing book which I recommend to everyone. I enjoyed it so much and I give it 5 out of 5 stars! I'm so glad it lived up to it's name for you! I've been almost a little intimidated to read it just because of all of the hype. I'm really interested though now knowing that the different POV's were done well! I really don't like reading books where all the POV's sound exactly alike. Great review! Yes! I definitely recommend this book. Thank you! I've been out of the blogging world for a while now (about a year) so I'm super behind on all the hyped up books at the moment. But this one sounds crazy good. And thank you for the glowing review! I just added this to my wishlist on amazon, hopefully I can get it on my kindle soon and start reading it. That cover does look amazing! I'm a new GFC follower! Hope to see you around! I also hope you get to read this book soon (it's really good). Thank you for following!